One of the best defenses against the many dental maladies that you can face is to practice excellent oral hygiene. And the habitual routines that fall under this category serve as the frontline protectors of your mouth, teeth and gums. Thankfully, there are several methods available to you, one of them being mouthwash. And your dentist has decided to weigh in with information on how to get the maximum results from this valuable supplement, as well as discuss the different versions that it comes in. What Does Mouthwash Do for Your Oral Health? Mouthwash serves as a major cog in the oral hygiene wheel. It washes away excess bacteria and food particles, and also helps to keep your mouth wet. Are You Prone to Cavities? – If you’re prone to cavities, you should consider using a mouthwash with added fluoride. This will help to strengthen your enamel. Fresher Breath – If fresher breath is your major concern, then a mouthwash with added zinc or chlorine is suggested. These ingredients neutralize odors without leaving a foul taste in your mouth. Bacteria Fighting – If you need something stronger to fight bacteria, an antibacterial mouthwash is the right choice. It has a harsher smell due to the higher alcohol content but has been proven to reduce the number of bacteria in your mouth by up to 75%. 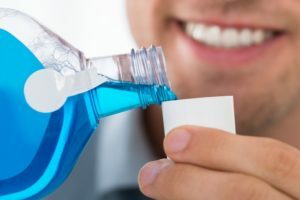 Gum Disease – If you have gum disease or some other type of serious condition, you should consult with your dentist to get the right type of mouthwash for your specific needs. The typical kind prescribed for such situations contain an antibacterial called Chlorhexidine, which can help treat redness, swelling and bleeding. A great time to talk about any issues that you are experiencing is during your semi-annual appointments with your dentist. He can cover all the bases by examining your mouth to determine if there are any serious issues going on, and also recommend what type of mouthwash you should be using. Furthermore, this offers you a chance to take the proactive route and prevent problems, instead of waiting on them to occur. Dr. Neil Flenniken received his undergraduate degree in nutrition from the Ohio State University and then went on to earn his Doctor of Dental Surgery degree from Howard University. With over 17 years of experience practicing dentistry, Dr. Flenniken is an Associate Fellow at the American Academy of General Dentistry. He practices at Flenniken Family Dentistry and can be reached for more information through his website.